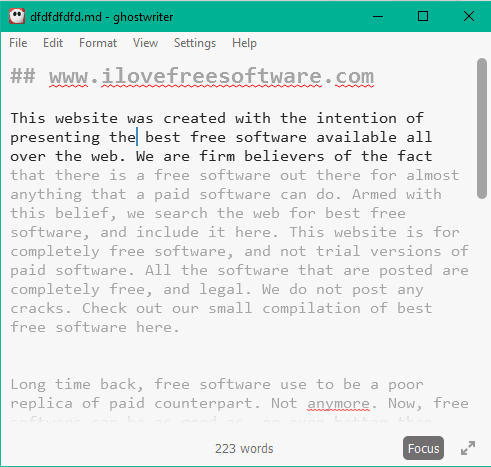 ghostwriter is a free Markdown editor that comes with a real-time spell checker, document navigator, and focus mode. As you type, it shows spelling mistakes and also provides suggestions by right-clicking on the misspelled word. You can also enable its focus mode which is very interesting. Focus mode lets you keep your concentration on the current line, three lines, or a paragraph. Rest of the content remains fade, which lets you concentrate only on the line or content that you want to focus. Its document navigator (known as Outline HUD) helps to quickly move to a particular heading. It automatically shows all the headings available in your document. You just need to click on a particular heading and it will automatically move the mouse cursor to that heading. All these features make it special and a very good competitor to other similar software. Above you can see its interface with focus mode enabled. You can save Markdown file as TXT file and export Markdown file as HTML. You can also preview the document in HTML before exporting to PC. Use View menu or hotkey (Ctrl+W) to preview Markdown document in HTML. It also comes with real-time word counter, which is visible at the bottom center of its interface. It lets you select Font family and size. You can make bullet or numbered list by accessing Format menu or using shortcuts. 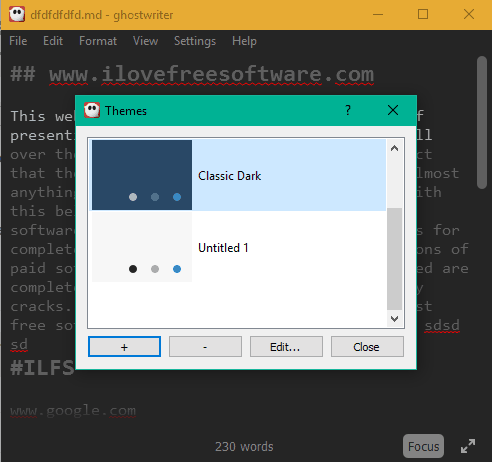 By default, light theme is activated, but you can select dark theme using Settings. Apart from this, it also lets you create a customized theme with any of your favorite text color, markup color, spelling error color, etc. 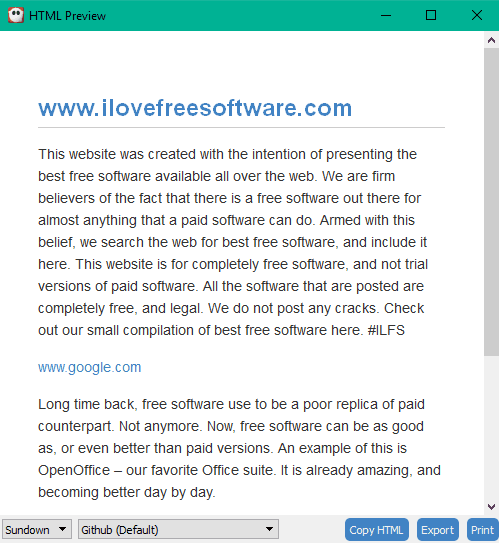 Find and replace tool also comes with this free Markdown editor. It comes with dictionaries available in different languages. You can access and set any dictionary using Settings. Supported languages are: American English, British English, Canadian English, Deutsch, and more. You can also take document print, insert strikethrough, use the editor in full screen, etc. So, one thing is clear that plenty of options are available that make it a very useful Markdown editor. Use this link to grab the installer or portable version of this Markdown editor. Open its interface and you will see a blank page only. Now you can start writing in Markdown. 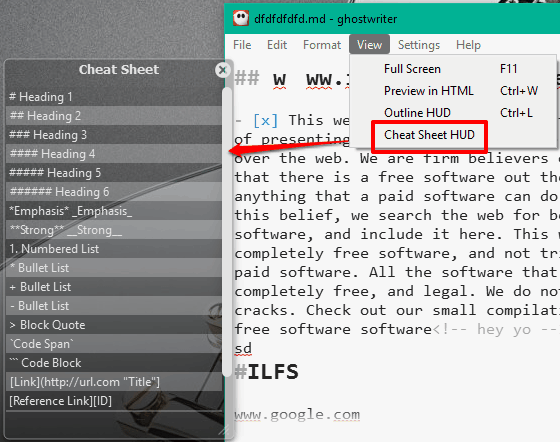 If you need some help, you can also access Cheet Sheet to view how to insert heading, numbered list, bullet list, etc., in Markdown language. While writing on its interface, it also detects spelling mistakes (if any) and highlights them. 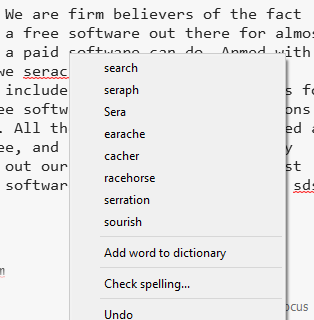 You can right-click on a particular word to access suggestions and add a word to the dictionary. 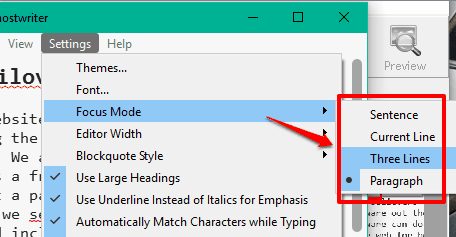 If you feel that you need some more concentration while writing or editing a document, you can enable Focus Mode (access Settings menu) and select the Focus Mode type: Sentence, Three Lines, Paragraph, Current Line, or Paragraph. 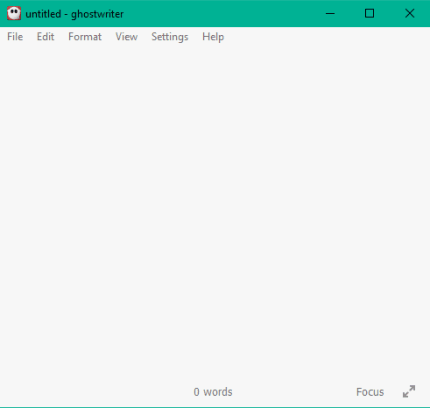 Enable any mode and start writing. Placing the mouse cursor on a particular area will focus only on that part. Use other tools I mentioned in features to get the maximum benefit of this Markdown editor. When your document is ready, you can preview it as HTML, and then save or export to PC. It’s true that this Markdown editor doesn’t come with a few other advanced tools, like tabbed interface and preview output side by side. However, the fact that it has many interesting and some unique features (live spell checker, document navigator, and focus mode) make it worth trying.